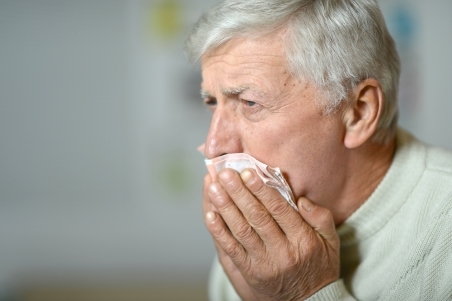 A persistent cough is a cough that lasts longer than six to eight weeks. It is also known as a chronic cough. Coughing is a normal reflex. It protects our lungs from damage caused by things that irritate our airways, such as smoke or chemicals. Most people develop coughs because of minor infections like those due to cold viruses. But when a cough becomes persistent, potentially serious causes need to be ruled out. If you have a persistent cough, see your GP so they can help you find out what is causing it and what you can do about it. Lung diseases such as asthma, COPD or bronchiectasis. Sinus disease and nasal drip (an inflammation of the sinuses). Acid reflux (when acid in your stomach climbs up to the top of your food pipe and irritates your upper airways). A group of medicines used to treat high blood pressure (ACE inhibitors such as lisinopril and captopril). A persistent lung infection such as tuberculosis. Don't ignore it if you cough up blood or your voice changes. See your doctor as soon as possible. When you see your doctor, they will ask you questions about your cough and examine you. In particular they will want to know if you have a moist or a dry cough. They may listen to your chest, and look at your ears and throat. testing a sample of your sputum (phlegm) to look for bacterial infections. The treatment for your persistent cough will depend on its likely cause. For a dry cough, it can sometimes be hard to be sure of the exact cause. Your doctor may recommend trials of treatment for asthma, sinus disease or acid reflux, to see if your cough improves. Often the treatment can take several months to work. Follow your doctor's instructions and go back to see them if your cough doesn't go away. Unfortunately, over-the-counter cough syrups or medicines don't usually work. If your doctor suspects your cough is due to asthma they may offer you an inhaler. They will also tell you about likely triggers such as pollen, exercise and pets. If the likely cause is sinus disease they may get you to try a nasal steroid (such as fluticasone, budesonide or beclometasone) or an antihistamine (such as loratadine or cetirizine). For reflux, they may treat you with a medication like omeprazole. This will reduce the amount of acid produced in your stomach. If the likely cause is a medication, your doctor may get you to try a different medication. If the cause is more complex, it may need to be investigated further by a specialist. Written by HealthInfo clinical advisers. Endorsed by community respiratory physician, Canterbury DHB. Page created May 2017. Last updated August 2018. HealthPathways – Chronic cough in adults, retrieved January 2017. Patient.Info – Cough, retrieved January 2017. Mayo Clinic – Chronic cough, retrieved January 2017.